All KENDALL POINTE homes currently listed for sale in Boerne as of 04/18/2019 are shown below. You can change the search criteria at any time by pressing the 'Change Search' button below. "Awesome 2 story with Guest house in the Desireable Kendall Point, with 3172 sf at Main house and 684 at Guest house. With 4 BR and 3.5 baths this home boasts privacy and majestic oaks, with Granite counters, SS appliances, high ceilings and covered patio leading to your Sparkling Pool & Spa. The Outside fireplace is a Perfect spot to relax with friends and family. Spectacular landscaping makes for great entertaining home, call for more details." "Gorgeous 2-story Mediterranean home w/3 bed/2.5 bath/3-car garage w/side entry, 3,429 sqft on ONE FULL ACRE in Kendall Pointe. Solid wood doors throughout 1st floor! 9' doors in central hall lead to living & dining rooms. Living room boasts spectacular pool view. Gourmet kitchen w/island, pecan cabinets, walk-in pantry & 6-burner gas range. Spacious master suite has bath w/garden tub, walk-in shower & double vanity. Covered porch w/pool & hot tub. Iron fencing. Exemplary Boerne ISD. WELCOME HOM"
"Immaculate 4BD/3BA home located on .65 Acres in gated Kendall Pointe, surrounded by mature trees. Sought after ONE STORY home features open floor plan, high ceilings, updated kitchen, stone fireplace, office/study or 4th BD & more. Spacious Master Retreat w/ outdoor access, perfect for enjoying your morning coffee on the covered patio. 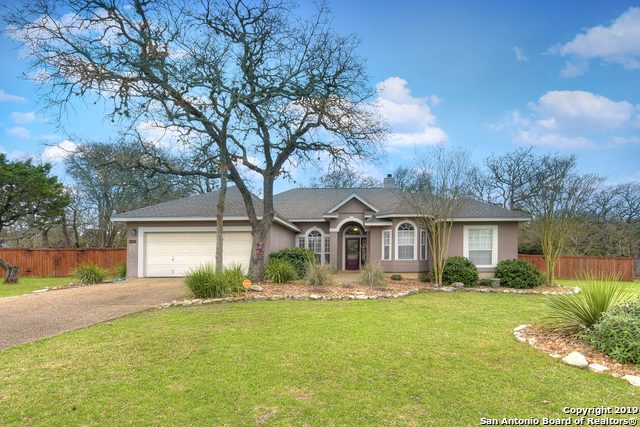 Enjoy the wide open space in your backyard while sitting by the fire on a peaceful hill country evening. Community includes pool, sports courts, tennis courts & "